The upcoming Solo: A Star Wars Story movie will re-canonize a villainous group that first emerged more than 40 years ago in Star Wars comics, and with that comes a badass new leader called Enfys Nest. Late last week, photos of a new Solo: A Star Wars Story toy emerged that confirmed a character named Enfys Nest would indeed appear in the upcoming movie. But this character is also a deep-cut reference to a very old comic from Marvel called Star Wars 8: Eight for Aduba-3. Which means that Solo will essentially re-canonize the Cloud-Riders after they became non-canon Star Wars Legends in 2014. Enfys Nest and the Cloud-Rider gang appeared briefly in the 'Solo' trailer. The Cloud-Riders are essentially a badass spacefaring motorcycle gang with incredibly dangerous bikes. If you thought the speeder bike from Return of the Jedi was cool, just wait until you see these crazy Swoop Bikes. Interestingly enough, it also looks like Boushh might be in the Cloud-Rider gang (bottom-right in the above photo). You’ll remember the bounty hunter Boushh’s costume as the outfit Leia wore when she went incognito in Jabba’s palace in Return of the Jedi before she was forced into wearing a bikini. 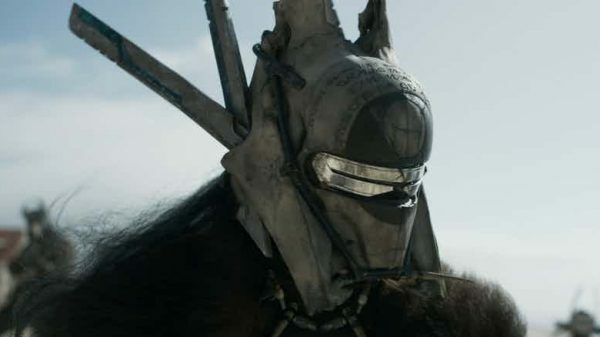 Enfys Nest in 'Solo' kind of looks like a Nazgûl from 'The Lord of the Rings'. Originally, the Cloud-Riders only made three appearances in comics with one mention made in a fourth. There, led by the pirate-looking Serji-X Arrogantus, they terrorized the citizens of Aduba-3, constantly raiding the village of Onacra. Han Solo and Chewbacca defended the villagers with their own rival gang, and most of the raiders were eventually killed by a monstrous beast. Solo’s version of these characters and this story will likely look very different, but it’s entirely possible that the mission Woody Harrelson’s character recruits Han and Chewie for is this one. Either way, expect to see lots of action with these Cloud-Riders when the film finally comes out.